The Motorola VerveOnes+ offer true wireless convenience in a sweatproof and waterproof package, but with a chunky build and no silicone wings for a comfortably secure fit they're not the best choice for sport. They're loud, and the EQ adjusting app is useful, but the sound quality is average at best. Despite a healthy reduction in price there's still little to get excited about. Despite most sane people still thinking they're a solution waiting for a problem, true wireless earbuds are here to stay, with launches from Apple, Philips, Jaybird, Onkyo, B&O, Motorola and dozens of no-brand Chinese alternatives on Amazon showing the big brands' desire to enter this category. With the VerveOnes+, Motorola – via the parent company Binatone – were one of the first to the high street, offering Bluetooth convenience plus a water-resistant build. On launch in 2016 they cost a mighty $250/£230 (around AU$315), which was ludicrously expensive given they didn't offer half the features of something like the Jabra Elite Sport, but as the competition has caught up the price has been slashed to $190/£180 (roughly AU$240) via the Verve.life website or even lower if you shop around. Motorola also offers the all-white VerveOnes Music and all-black VerveOnes True, which are both almost identical, but lack the VerveOnes+ waterproof build quality. But are any of these really worth the outlay? How good do they sound in comparison to, say, a pair of $100/£75/AU$125+ wired headphones? Will the battery life bother you? And won't you be constantly worried about losing them? Whether you think they're a daft idea or not, there's no denying the engineering expertize involved in squeezing speakers, Bluetooth receivers, Siri/Google Now control and more into LEGO brick sized (35 x 35 x 90mm) earbuds. They're not the smallest or lightest earbuds, but with an IP57 rating they can be dunked to depths of 1 meter for 30 minutes, which is impressive, if not a bit over the top. Splash and sweat proof would have sufficed, but at least you're safe if they pop out into your sports drink. They're nicely put together , the matte rubber finish can be gripped easily, and the large single button on each ear – for skipping tracks, pairing and voice control - can be pushed easily without shoving the whole earbud further into your head. The charging case, while enormous compared to the Apple AirPods dental floss case, is nicely designed, protecting the buds and offering an extra three full charges. It's not pocket-friendly (unless you’re a lover of cargo pants) though, which means you'll need to carry a bag, or make sure you're not off anywhere for more than a couple of hours. Take one earbud out of the case and, after an initial pain-free pairing process, the Bluetooth connects quickly. Pop out the second bud and sensors recognize the action and connect it all together. It can take 15 seconds to be up and running, which is quite long, but just enough time to make sure the earbuds are wedged in your ears. The VerveOnes+ come with six sets of rubber ear tips to help secure the fit, but unusually there are no wing tips included. Those little flanges of silicone are sorely missed here, and while the rubber-backed earbuds do a good job, they don’t feel especially secure, and would benefit from the second line of defense the wing tips would offer. That said, despite being a bit bulbous, and feeling like they shouldn’t stay put, the fit was deceptively secure. If you don’t sweat much when you exercise the sense of freedom as you run is hugely enjoyable, but if you drip like a leaky tap they will slip eventually. Conscious of the lack of silicone wing tips, we were constantly checking the position of the buds as we ran… just in case. As for battery life, the Motorola VerveOnes+ suffer the same fate as many true wireless earbuds. Without the top-up battery from the charging case you'll do well to get two hours from each earbud. Fine for a commute, but hopeless for marathon training. The battery case is generous though, offering three full charges before it needs to be plugged in. You'll still not want to take them long haul, but at least you can top up while at work. We did run into a few connection issues when testing, with the left and right ears dropping signal for a second or two every now and again, and the Bluetooth stuttering heavily if we put our phone in our bag instead of the front pocket of our jeans. We've experienced similar issues with many pairs of true wireless earbuds, so it's not unique to Motorola, but that doesn’t stop it from being irritating. So, the Motorola VerveOnes+ fit surprisingly well, but how do they sound? In one word; average. They’re not terrible, and tweaking the EQ settings via the companion app can improve things – especially with the bass, but they sound no better than a cheaper pair of wired headphones. If you’re after in-ear headphones with detail, punchy bass and a well-balanced tone, you might be disappointed, but if you need loud, thumping gym companions these will do the job. Most companion apps can be dismissed once initial Bluetooth pairing has taken place, but the Hubble does offer a few handy extras, most notably the EQ settings. Playing with these can make a huge difference to the sound quality, and help boost the volume. You can also turn on 'Ear Detect', which means the buds will pause when you take them out of your ears, plus 'Pass-Through' which allows more of the outside world in; handy if you run along busy roads. There's also a small map showing the current and/or last known location of your earbuds. Potentially useful if you need confirmation that you've left them at work, but the tracking only works for the charging case, not individual buds. So there's lots to tinker with via the app, but in our extensive test we found the app buggy, difficult to sync and that it dropped connection regularly. 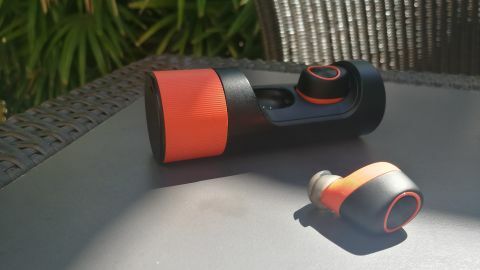 True wireless earbuds are great fun, and offer new levels of freedom, especially if you love to run. Not having a cable takes getting used to, but it is liberating, and once you secure them and trust the VerveOnes+ not to pop out you'll forget they're in. The cable free convenience also means you won't have your ears violated when you snag the cable when taking off a bag/coat/hoodie. They're also well-built and offer decent protection against sweat and the elements. Despite the impressive feature set the overall experience is a bit clunky, with all-too-frequent connection drop outs and app glitches spoiling the experience. Battery life is also too short – even with the battery pack – and while topping up is quick and convenient, it's hardly ideal if you're staring down a long train journey and you can’t watch a film without needing a recharge. Sound quality is also mediocre compared to similarly priced wired (or Bluetooth) headphones, with a lack of detail and balance. It's fine for running, gym work and commuting but don't expect more than basic playback. The Motorola VerveOnes+ are impressively robust, they have a just about acceptable battery life and connect seamlessly to your smartphone, but you'll be lamenting the sound quality and lack of silicone wing tips, which would give them universal security. As a result, don’t be surprised if you spend more time pushing them back in your ears than pushing for a personal best. The price drop will make them appealing to many though and they remain superior to the cheap no-brand options available. The companion app and ability to tweak the sound quality is extremely useful, and they're undeniably fun to use… assuming you can find your perfect fit.